Submitted photo Fairborn grad Aaliyah Patten scored Wright State’s only goal Aug. 19 in a 1-all tie with Toledo. FAIRBORN – The Wright State University women’s soccer team opened the home portion of its 2018 season Aug. 19 with a 1-1 tie against the University of Toledo. The Raiders began the first half of play in their defensive third section of the field for a good portion of the opening 45 minutes. Wright State’s defense held the Rockets to just two shots on goal, both of which were saved by Maddie Jewell. The Raiders managed four shots on offense, with just one being on frame. After a scoreless first half, the pace of play began to open up for both teams in the second, as the Raiders began to push toward the Rocket offensive third of the field. After increasing the attack in the second half, Wright State finally broke through in the 64th minute when Aaliyah Patten took a lead pass from Erin Graefen and made a great move around Rocket goaltender Madison Perrin and slotted home her first goal of the season for a 1-0 lead. The Rockets tied the game in the 70th minute as Hannah Scafaria took a pass down the middle of the field and poked the ball into the top right corner from inside the box. The two teams played two possession-heavy overtime periods with each team recording a couple quality chances during added time, but both offenses were turned away by the goalkeepers. The final shot tally finished 17-11 in favor of the Rockets (0-1-1). Wright State (0-1-1) will return to action at 8 p.m. Friday, Aug. 24 when it visits the University of Cincinnati. For more information on Wright State athletics, please go to wsuraiders.com . 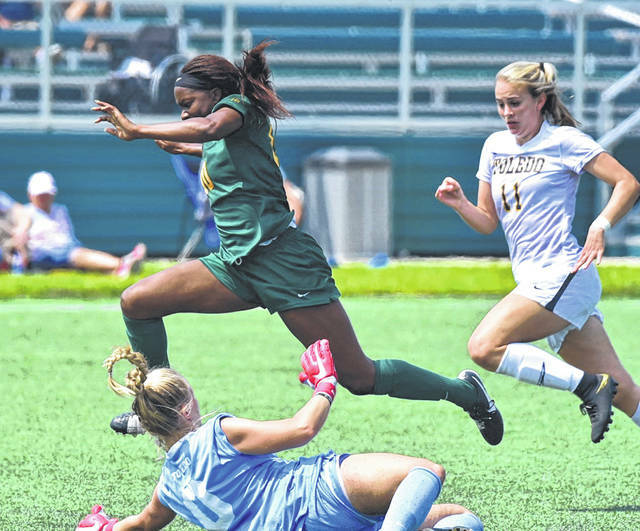 https://www.beavercreeknewscurrent.com/wp-content/uploads/sites/49/2018/08/web1_patten.jpgSubmitted photo Fairborn grad Aaliyah Patten scored Wright State’s only goal Aug. 19 in a 1-all tie with Toledo.